Crystal Craft! I have watched in astonishment as Crystal Craft has become incredibly collectible. Think the wired daisies with faces that proliferated in the 70s, and those resin daisy coasters with broad smiles in bright colours. This is a collection of Crystal Craft ‘Daisy’- resin trivet and matching coasters. If you, or anyone you know has a Crystal Craft addiction – then – call a help line, or buy them this collection. Crown Lynn produced pottery in New Zealand from 1854-1989. By the 1960s Crown Lynn was producing export quality pottery with very funky 60s designs- of which this set ‘Daisy’ with those quintessential 60s flowers- was part. Crown Lynn was exported worldwide – which is why I frequently hear from people living in America who grew up with Crown Lynn crockery – and consequently it is now very collectible. In researching the pattern I found the ‘Daisy’ pattern is quite rare- and increasingly hard to find. It was produced in only two colours- this rusty-orange and a pale yellow. The bowls are both in good vintage condition with only minor evidence of use in the past fifty years. 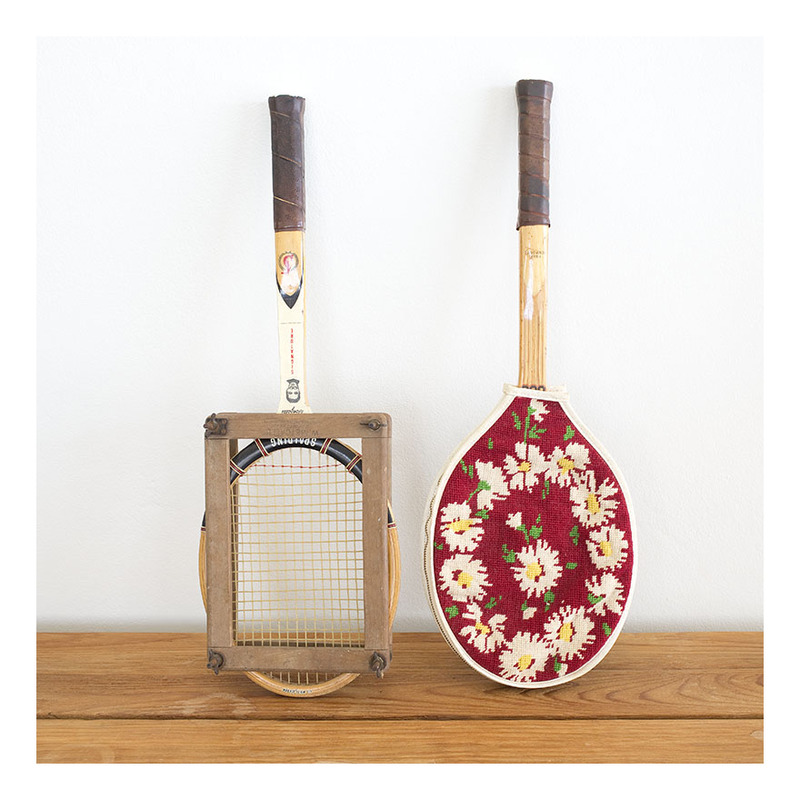 Never having played a game in my life, I was gifted the beautiful timber racquet on the right [in the 1950s cross-stitched daisy cover] – by someone who played a great deal. In the 50s and 60s. I was so taken by the hand-made cover [I found a copy of the original pattern on-line] which has a large metal zip opening and a deep red vinyl backing. The racquet and cover have been carefully conserved between their playing life and being gifted to me. I find the whole thing beautiful. Given all this, I still love the hand-stichted daisy racquet cover the most; despite having learnt a great deal from researching www.tennishistory.com.au.